Indian Jesuit priest Alexis Prem Kumar who was kidnapped in June 2014 in southern Afghanistan was released and reached New Delhi on February 22 with the intervention of the Indian government. “Delighted at securing the release of Indian Jesuit priest Father Alexis Prem Kumar from captivity in Afghanistan,” tweeted Indian Prime Minister Narendra Modi on 22nd afternoon as the priest was on a flight to New Delhi. Prime Minister Modi himself also rang up the family members of the 48-year old priest in Chennai – capital of southern Tamil Nadu state – and broke the ‘good news’ to the family. “Have spoken to Father Alexis Prem Kumar. Informed happy family of Father Alexis Prem Kumar of his safe return after 8 months in captivity,” Modi said in his tweet two and half hours before Fr Kumar landed in New Delhi. Following the tweet, over three dozen media people, along with a dozen Jesuits and other priests, were at the international airport awaiting Fr Kumar’s arrival. 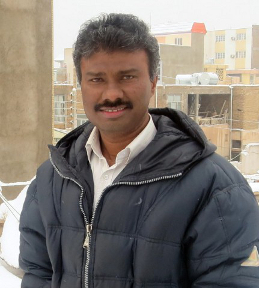 Based in Afghanistan since 2011 and heading the Jesuit Refugee Program (JRS) there since 2012, Father Kumar was abducted by gunmen on June 2 at a school built and run by the JRS at Sohadat village in Herat province. “The Prime Minister spoke to me. When he was speaking I felt that the whole of India was welcoming me. I am grateful and thankful to the Jesuit and all others who have worked for my release,” Father Kumar said. “We are thrilled. Words are not enough to describe our feelings,” John Joseph, younger brother of Father Kumar, who was flown to Delhi along with his 78-year old widowed father A. S. M. Anthony and sister Elizabeth Rani, a nun of the Congregation of Foyer de Charité and principal of her convent school at Vellur, by the government round midnight, told World Watch Monitor on 23 February. “Our prayers have been heard. God is there,” said Joseph, an engineer by profession. “Anything about Afghanistan or what happened (to me), I am not ready to share now. Please pardon me,” pleaded Father Kumar with the media who waited for him at the hotel – when the question was repeated. “I have plenty of stories (to share). But I feel it is not the right time to share all those about the time (I spent in captivity),” reiterated the priest. Father Joy Karayampuram, the JRS South Asia spokesperson, in a press statement thanked Prime Minister Modi and the foreign ministry ‘for securing the safe release’ of Father Kumar. Hailing from southern Tamil Nadu state, Father Kumar had worked over 12 years in areas of social action and development including Tamil refugees from Sri Lanka and with tribals. Director of the JRS in India from 2005 to May 2011, he took up assignment with the JRS in Afghanistan in July 2011 and was heading the JRS operations in Afghanistan when he was kidnapped. JRS has been working in Afghanistan since 2008, accompanying returnees home from exile in Iran and Pakistan and providing education and healthcare services in Bamiyan, Kabul and Herat. In 2013, more than 6,000 disadvantaged people from disadvantaged communities benefitted from these services, according to the JRS. Father Alexis had found mention in the Vatican Congregation’s report on church workers killed and targeted during 2014. Fides, the Congregation’s news agency, said the fate of five abducted priests belonging to religious orders, including Father Kumar, was ‘unknown’. Though neither the government nor Father Kumar gave any clue regarding the kidnappers or their motive, the Times of India in its report on his release hinted to a ‘burgeoning kidnapping industry in Afghanistan’. Quoting a ‘top intelligence officer’, the report on February 23 described the priest’s kidnap ‘as part of the conflict economy’ fed by tens of billions of dollars that the international forces and community have pumped into the country since 2001. “The law and order situation has worsened due to inherent differences within the Unity government of Afghanistan… This has given Taliban and other petty criminals an opportunity to indulge in extortion via kidnapping of foreigners either associated with journalism or aid workers or private civil contractors,” the official said, recalling how most abductions ended either in payment of ransom or killing of the hostage.